I needed Ethernet connectivity to my home lab in the garage and short of running in some CAT6, the wireless signal was bad so it came down to Powerline, i.e. Ethernet over the mains power. Powerline, or HomePlug, comes in many variants. HomePlug AV seems to be the most common standard at the moment and on AV500 prices have really dropped and is the one to go for at the moment. For £25 you can get an AV500 starter kit consisting of two plugs. 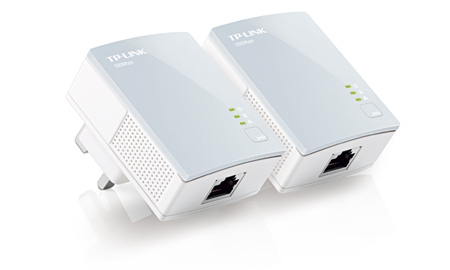 These won’t have pass through or have more than one Ethernet port and may or may not have a Gb Ethernet port as opposed to 100Mb ‘Fast Ethernet’ port. TP-Link is one of the most popular and gets good reviews, so I bought the TP-Link AV500 Nano Powerline Adapter Starter Kit (TL-PA411KIT). Although its called AV500, you won’t get anywhere near this. This is starting to sound like the broadband providers advertising! The AV500 Nano only has a 100Mb port so 500 is never going to happen. These worked straight out of the box. They are extremely small and don’t block any adjacent power sockets. I like the design and seem well made. The two-tone colour is nice and the pair button is located on the front along with lights to show power, connection to a Powerline network, and Ethernet connected. TP-Link also does a newer model called AV600. Now this does come with a Gb Ethernet port so the 100Mb port that the AV500 comes with wont be a limiting factor. I just had to try the AV600 and do a comparison! The AV600 Gigabit Powerline Adapter Starter Kit (TL-PA6010KIT) is over double the price in the UK compared to the AV500. Amazon for example has the Av500 at £25 and the AV600 at £56 at time of pressing this (Feb 2014). Is the Av600 worth the £31 premium for which you could buy another two Av500 plugs(!). I set about finding out. Firstly the AV600 has a slightly different design. Its all white, and although height and width about the same as the AV500 it does stick out from the socket about 10mm more. It is still pretty small though compared to HomePlug adapters of old. The pair button has been moved to a much smaller button on the underside, the lights have a different arrangement and the Ethernet port not quite as nice coming without a metal surround. Maximum test: Plugging both Powerline adapters adjacent to each other in a 4-way extension block. Same ring test: Plugging one Powerline adaptor in a wall socket in one room and the other Powerline adapter into a wall socket in another room on the same ring main, i.e. on the same floor in the house. Different ring test: Plugging one Powerline adaptor in a wall socket on one floor, and the second Powerline adapter into a wall socket on a different floor and hence the signal would have to hop rings via consumer unit. Test 2 would be typical situation maybe in a flat where you would have a single ring main with your router in one room and PC in another room. Test 3 would be in a house with maybe your router upstairs and PC downstairs. For my tests the ‘source’ end was connected to a Netgear Gb switch into which a NAS was also connected via Gb connection. The ‘destination’ end was a laptop with a Gb port. A read/write share was used on the NAS. I loaded LAN Speed Test (Lite) v1.3 onto the laptop to run the tests. The table below shows the results (all figures in Mbps) using transfer of a 100Mb file. LAN Speed Test creates a temporary 100Mb file on the source and uses this as the write test, it then reads it back as the read test. The results in the table were an average of 5 runs. Something to note is its the Powerline transfer of data that is the limiting factor and there is very little difference between read and write. In fact on some runs write came out ahead of read. The maximum test was a bit shy of the test that avforums performed. They managed to get 164Mbps read and 158Mbps write. My results did vary however up to +/- 5Mbps but I never saw results this high – probably comes down to the type of test and file transfer used. The Av500 in comparison was quite a bit lower – less that 100 as expected due to the Fast Ethernet only port. The gap between the two was ~60Mbps which is quite significant. However, no-one will be using these plugs in the same 4-way.. so on to the real world tests. For the second test the Av600 dropped quite a bit, ~25% from maximum, whereas the Av500 only dropped ~3%. I was expecting similar drops on both so not sure why the Av500 dipped so little. For the last test where the signal had to jump ring mains via the consumer box then the drop was much less marked in difference, the Av500 dropping ~51% from maximum and the AV600 dropping ~57%. I also did one final test using just the AV600. For the ‘Same Ring Main Different Rooms’ test, at the destination end I put the adapter into a 4-way extension instead of directly into the wall socket. The difference was considerable. Instead of the 110/111 figures previously achieved, I only got 65/60. This shows the importance of trying to get the cleanest signal possible and using wall sockets in preference to extensions. Finally I did a test using XBMC. This is Media Centre software and I used it to play a blu-ray rip stored on my NAS on my laptop which had XBMC installed. I did the test using the Upstairs / Downstairs (different ring) scenario. This would be where for instance your NAS is upstairs and TV Streamer or media centre PC downstairs plugged into your TV. On both Av500 and Av600 playback was flawless, no buffering or dropped frames. I could have done a lot more tests with file transfer times and the like, however I was mostly interested in comparing raw figures for this test and to see whether its worth the extra expense of Av600 over Av500. Whilst I would recommend either of these adapter kits, I don’t think the AV600 is worth over twice the price of the AV500. If you want to play HD videos, even across floors in your house, then get the Av500 kit and save your money! The only slight caveat to this is if you have multiple people all using Powerline at the same time – all the bandwidth will have to flow through the ‘source’ plug therefore it would need to cater for the multiple HD streams at the same time. The Av600 is marked on the box as supporting ‘Multiple HD IPTV Streams’ compared to the AV500 box that says ‘Multiple IPTV Streams’. However unless your whole network is based upon Powerline, then this shouldn’t worry you. Connecting to my home lab in the garage from my study upstairs using remote desktop Powerline does the job, admirably. 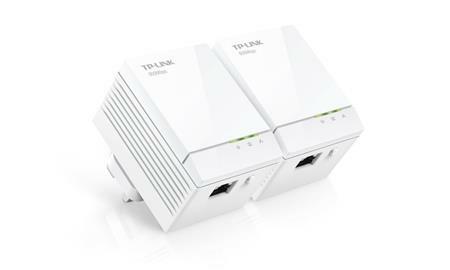 TP-Link has already announced the TL-PA8010 which is AV2 1000 rated and will be out Q2’14, so if you do need the extra bandwidth, and can afford to wait, then it will be interesting so see what the next step up will bring! Picked up a single AV500 (TL-PA411) to avoid trailing wires from the Pi. No problems at all streaming HD 1080p content from NAS which is connected to the AV600. You can mix and match AV500 and AV600 without issues. If you are using few of these at the same time, then probably a good way to go – i.e. the ‘master’ plug as an AV600 and the ‘client’ plugs being AV500. Thanks for this excelent quality review! I wasn’t really sure about buying AV600 because of transfers comparsion to AV500 and lack of reviews. Because i’ve got busy local network, nom i’m sure, it will be best solution for me. Thanks once again. Thanks for the review, I came across the review after buying these already. I have a GB router and GB card in my pc but my LAN status shows 100mb not 1000mb, do you recall if your pc recognized these as gigabit? Hi, both my PC and Linksys switch both pick up the AV600 as a Gb connection. Have just checked. Definately. I have the AV600 connected direct to my router and both an Av600 and AV500 round the house. If you have a few plugs then good idea to have higher rated one at source. still around? im looking to get one to increase my ps4 connection speeds (downloads are slow, games drop or lag a ton…). was wondering if one of these was better than the other for gaming, any suggestions? Hi, these are pretty old models now. I have actually got an AV1300 kit now (TL-PA8010P KIT) which I loaned but coming back soon. If I get some time I’ll update the tests to compare to the AV1300. If your wireless is not so good, then these are rock solid these days compared to the very early ones. If you can watch a bluray rip over a powerline, I would have thought the more than man-enough for the PS4.